I don’t want one of those ornate wooden double front doors which seem to be popular. 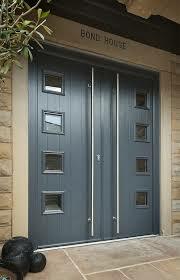 I’m after a double UPVC or composite door with a full height push/pull handle. They seem really popular in the UK with loads of websites showing different designs & patterns. I’ve tried Windsor, Arc, Deku, Europvc, Trade UPVC as well as the usual suspects like Global etc. None seem to show any designs on their websites that I can see & none have replied to my request for a brochure. 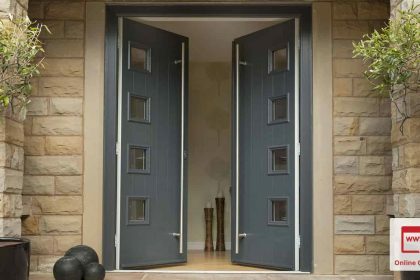 Just saw you want uPVC, so my comment not pertinent but in the UK a lot of people will use door blanks (fire check doors) which would work fine if you treat them properly. If you decide to try the door blank (very inexpensive) method I can help with advice, I did lots of them when I owned my joinery in the UK. Those doors look more commercial than domestic . Although looking at how they are hinged , im guessing not that heavy . You may well have to get them imported or custom made. Custom making them is a breeze, we used to knock them up 20 or 30 at a time for schools. Now you've pointed it out, yes they do look commercial don't they. I'd not really noticed & the example picture I cribbed is a domestic property on a normal UPVC installers website so not thought about it. The style of door is not difficult to find, but I've never seen the full length handles just shorter versions of them. Cheers Vince, I only thought about UPVC or composite as thats the only material I can seem to find examples of this style I like. Maybe its because thats the cheapest option in the UK? I'm certainly not precious over the material & if this style could be recreated in wood with a decent locking mechanism then I'm all for it. I've got a 270cm opening so thinking 2 x 100cm doors with 35cm (less frame) frosted glass infills on either side. True with the handle, I've not found anything like them yet. Maybe an option to bring over on the plane next time. They are from Prime-Asia and I reasonably sure that if you want the hande to release the lock then you are going to have no choice but to go with a complete door and handle. I've never seen that type that activates the lock available separately. Or you are going to have to import the hardware yourself. Last edited by sometimewoodworker on November 15, 2018, 5:46 pm, edited 1 time in total. Maybe an option to bring over on the plane next time. If I squint at the picture a bit closer the handle looks like its just a standard push/pull so presumably the same inside. The lock looks like its a normal deadlock affair halfway up the left hand door which I'm good with. I guess one door is dead bolted top & bottom with the main opening door using a mortice type lock which would be fine. The Häfele ones look just the ticket although 32mm diameter for the 2m long ones seem a little thin, I would expect something a bit chunkier. Nice one though, I couldn't find anything like this at all. Vince wrote: Custom making them is a breeze, we used to knock them up 20 or 30 at a time for schools. I would have thought a reasonably thin, long bubble wrapped parcel would go through the oversize luggage counter okay. We saw some chaps & chapesses taking surfboards the other year & they'd be about the same length but wider. It does help if you know where to look. The handles I quoted were only 1 and there are about 8 more stiles to choose from. I don't have my Häfele catalog with me at the moment as it's in the other house so can't give part numbers but you can download the Häfele app and they are in the architectural catalog. Also why would you want anything thicker than 32mm, just try to get a comfortable grip on a thicker one. You will use up one of your permitted bags though.